Today, we’re going to show you how to install and use the “File Manager” plugin on your WordPress website. What is FileManager and why do you need it? There are millions of websites over the web that are based on WordPress. All of them are hosted by the different web hosting companies and it depends on the certain hosting provider goodwill whether they decide to provide you with an access to your site files or not. In case your hosting plan does not include the access to site files but you badly need it, the FileManager comes as a solution. Also, it’s a very useful even if you have a cPanel with the File Manager tool at your hosting, as this FileManager works directly from the WordPress admin panel and lets you keep all the settings at one place and save the time. To sum up, the FileManager is a useful plugin for WordPress which can be installed to your website and then used for reaching the website files directly from the WordPress Dashboard. The FileManager plugin is provided for free by default so you can download it as a ZIP archive at https://wordpress.org/plugins/wp-file-manager/. You can also look for it at the ‘Plugins -> Add New’ section of your website dashboard, just type the plugin title to the search field at top right. There are several versions of the File Manager available, we’ll use the one created by mndpsingh287 for this tutorial. How to install the FileManager? In order to install the plugin, you should go to ‘Plugins -> Add New’ menu in WordPress Dashboard, click the ‘Upload’ button at the top and use the ‘Browse’ option to upload the plugin package if you have it as a ZIP archive. Alternatively, you should look for it using the search at the ‘Plugins -> Add New’ page as we described above, and then click ‘Install’ and ‘Activate’ buttons. How to use the FileManager? To start using the plugin, you should activate it first. 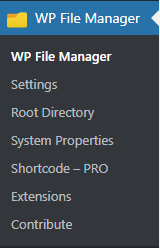 Once it’s done, you’ll see the ‘WP File Manager’ label at the left-side menu, feel free to use it to reach your website files. You can upload the new files, rename the existing files, copy folders and do everything else what you’d normally do in your hosting cPanel. It also has several designs available and supports different languages, so you may adjust it to your own preferences. Important: please, be careful while using this plugin for editing your site files. In case the site goes down as a result of your edits, you might not be able to reach the WordPress admin panel and the File Manager anymore! That’s why, please, better don’t add the codes you don’t understand. The plugin has also the paid version which can be ordered from theme author at http://filemanager.webdesi9.com/product/file-manager. It will let you get an access to the Advanced settings of the File Manager plugin and even let you show the file manager on the website frontend with the help of shortcodes.